I got Günter at 3 months. On the way to get Günter my car broke down and we ended having to get our other car after towing ours back home. I was determined to have this pup pup. We got him for a really good price to since the lady messed up on the price in the paper. He is a pure bred, German blood line. He came with papers and all. I haven’t regretted it since. He is definitely very intelligent. I have only had him for a month now and he knows all his basic commands sit, stay, lay, come, stand, wait and heel. I spend lots if time with Günter. Lots of short period training, but it’s already paying off. Günter loves the dog parks, walking trails, and hanging with other dogs. He shows no fear and is very socialized. After advancing his basic commands I’d like to get him into shutzhund obedience training. He likes lots of exercise and mostly spending time with his family. Let me tell you he is quite the character, during car rides he likes to put his paw on your arm like he trying to hold your hand as he sits next to you. Günter is truly a Godsend. Thanks so much for sharing your handsome little Günter with us all here. He is truly a beautiful sable German Shepherd puppy. Good for you in spending so much training time with him. I wish everyone did this with their dogs. It will be passed back to you again and again in the future so you'll never regret this initial training that you're doing now. Keep us up on his progress and maybe sometime in the future you can send us an update. We'd love to see pictures of him too if you decide to start the Schutzhund training since so many people are completely unaware of what that is. Good luck! Bringing home a new puppy,nothing better. Your little angel is so Adorable and that little face of his, just Precious! It be better when he rides in the car to put him in the back, it will be better for him too. That's great he is learning so well. 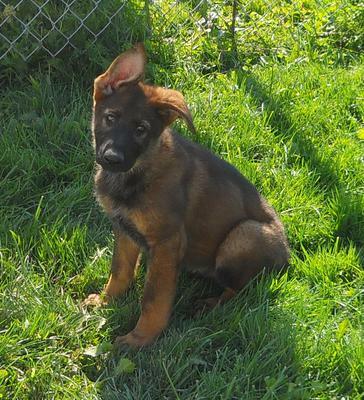 German Shepherds are Amazing and what a Protector he will become. Take care of your boy and he will take care of you! If you go for rides in the car with your puppy, teach it NOW to ride in the back seat and in a seat belt made for dogs or a soft sided crate. My GSD is now 3 years old, very large and loves car or truck rides. He knows the command 'Go Home' for getting into the back seat of the vehicle. He will go into the back seat and sit, waiting to be belted in. His seat belt will work with a harness or collar, though I prefer the harness. I dread anything happening to him and have been told some horrible things to do be other people while riding with him. I was going to enroll him into a class for special obedience and when the trainer suggested I just put his leash out the passenger door to hold him in the car I refused to use this trainer to train my dog. In an accident my dog's neck could be broken. People get dogs just for show and don't even care about their dog getting injured. While driving, did you know debris can fly into your dog's eyes seriously hurting them? I won't let my dog hang his head out a window because of this. I love him, would hate myself if I allowed him to be hurt by my negligence. Some dogs are more timid. A woman traveling in excess of 60 miles and hour had a car accident. She lost consciousness on the highway, and because her dog was not seat belted and she was unable to control him, he jumped out of the car and ran away. People had to avoid hitting the frightened dog who deserted his person in the car. Luckily, this Golden Retriever was located later, but this could have been an even more horrible situation. Micro-chipping is also an important thing to do, if you love your dog. Teach your dog how to behave in the house while you are away as soon as possible. He or she should never be locked in a crate while left alone for long periods. A person I know had 2 adult Rottweilers who had never been taught how to behave in the house while alone. Someone broke into the house and stole everything while those dogs would have been a formidable threat, if only they had not been locked up. Your dog should not be left out in the back yard all day in any weather. People have had their dogs stolen. In one terrible case, the dog was shot and killed while left alone in the yard. Also, wild animals can attack your dog and kill him or her. Wild animals attack in packs and many dogs cannot defend themselves in that situation. If you love them, teach them while they are young. The best breeders begin teaching them how to behave while they are in their homes, where most puppies are born (to good breeders). Love them and protect them, and they will give all they can in return.